I’m glad to be part of today’s Ann Butler Designs and Clearsnap‘s Lovely Crafts Hop. 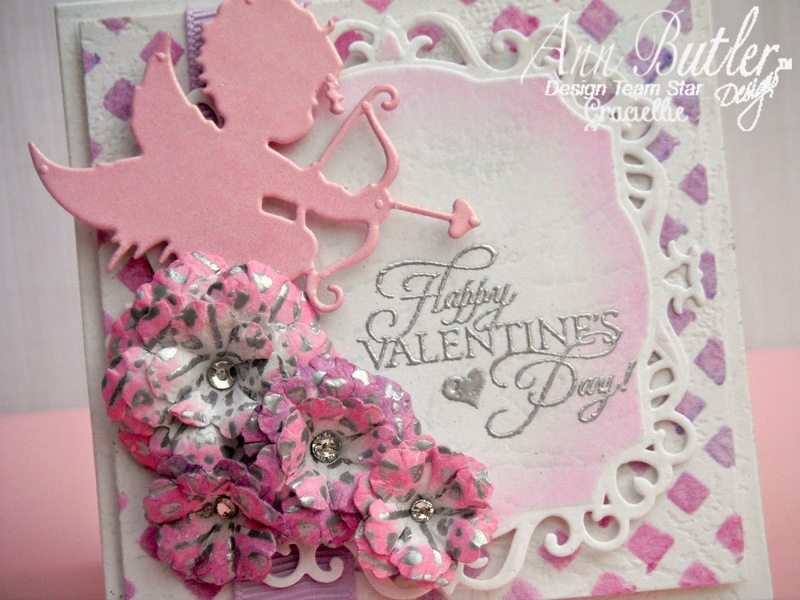 Designers from both companies will be sharing Valentine’s projects using Clearsnap’s products by Ann Butler! I am sure you’ll enjoy seeing all the different things created for you! I am sharing a mini Valentine’s card idea that I think would look great added to a treat bag or a chocolate box! I made a few handmade flowers that I die cut from cardstock I stamped and heat embossed in silver previously with a Background Basics stamp. Once I put the the flowers together, I inked them with Berry and Lilac Crafter’s Inks. I die cut a label that I stenciled with a bit of Berry ink. I heat embossed a Valentine’s greeting in silver on the label too. You should know that Crafter’s ink works great for heat embossing neatly. I stopped using embossing ink and instead I only use Snow Crafter’s Ink to heat emboss. I also stenciled a square mat for the background using the NEW Lattice Ann Butler Art Screen. I used an art dauber to apply a mix of Berry and Lilac ink. Once stenciled I heat embossed the mat with Colorbox clear embossing powder. Finally I put the card together, adding the flowers to one side of the label and decorating them with rhinestones, as well as mounting a pretty cupid die cut on the side and a piece of ribbon. I hope you liked my Valentine’s card. 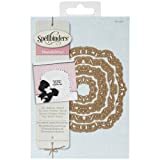 Every supply used to make my card is linked below! Before you go make sure you visit the blogs listed below for more inspiration. Leave a nice comment on each blog for a chance to win a prize from Clearsnap! Have you thought of me? very pretty card! love the flowers! Beautiful card.. I love the colors you used for the stencil and what gorgeous flowers. This is gorgeous! I love the various techniques you used and thank you for sharing what you did and the inks used – such a beautiful card! I need to try something like this with flowers – these look fabulous! Oh what a pretty card. Someone is going to be very lucky to receive this. TFS! 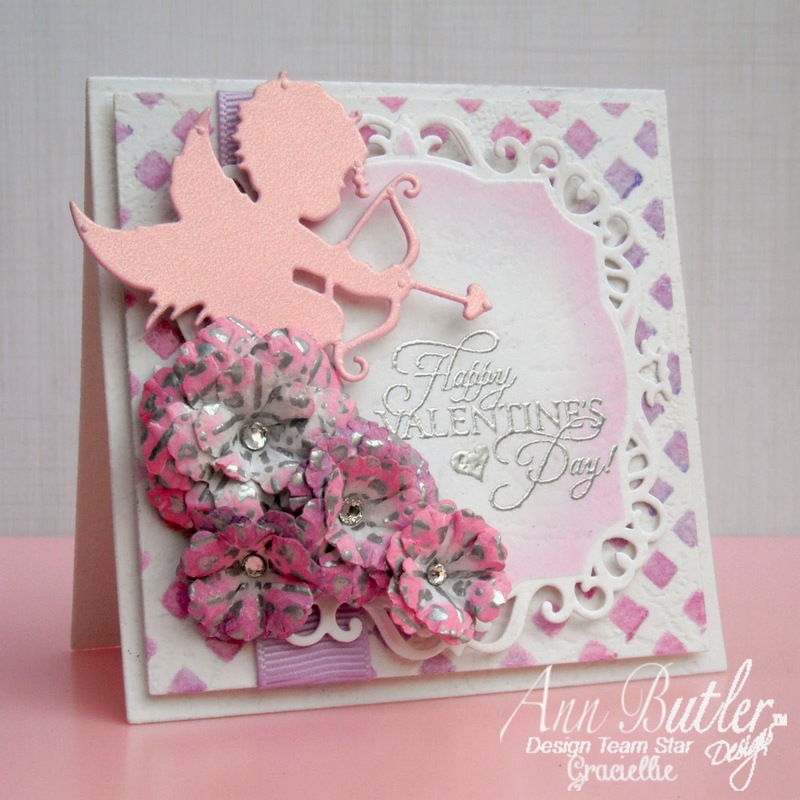 Gracie this card is absolutely Stunning, I love the way you blended the colors with the stencil for the background! So lovely and delicate! Very feminine card any lady would be lucky to receive! Stunning card. Your handmade flowers are beautiful. Sweet! Love how the backgrounds turned out! Another great and beautiful project in this hop ! This is beautiful. I love the lattice work, the little angel with his arrow, and the flowers. The color is lovely. So beautiful, Gracie! I love the peekaboo lattice with the art screen! SOOO pretty! I love your elegant designs! Stunning, wow…..I love everything about your wonderful card. The homemade flowers are beautiful. What a sweet project. I just love these background stamps and the endless possibilities. Lovely card. I like all the special details. This card is absolutely beautiful. I love the pink colour theme and the lovely flowers, in fact everything is perfect. I love the lattice screen inking and the flowers. Beautiful! Wow, this is so super cute. Gorgeous card! Those flowers are so beautiful! Thanks for joining us @ Red Rubber Inspirationals! What a beautiful card!I love the flowers! Your card is stunning! Thank you so much for playing along with us at Creative Knockouts:) Hope to see you again! Such a beautiful and romantic Valentine – love the flowers. Gorgeous card, beautifully designed and love those handmade flowers. Thanks so much for joining us over at Creative Knockouts, good luck and hope to see you again. You make such gorgeous cards and this is one of the prettiest! Beautiful card – so elegant.